Sometimes if you let yourself dream big, windows end up always open, a breeze constantly swirls around you, as if seamlessly putting pieces all together, helping to make that dream come true. That is the case, above and beyond with Happy Soul Project's "Painting Outside the Lines" Collection. What started as an idea to support artists with special needs has turned into a beautiful collaboration and a friendship that I am oh so grateful for. I am outrageously happy, ridiculously excited and honoured to work with a very special Mother-Daughter Team who make all of our inspiring art pieces in our "Painting Outside The Lines" Collection. I first met Tricia through Instagram and was immediately drawn to her positive spirit, sense of style and crafty/creative talent. 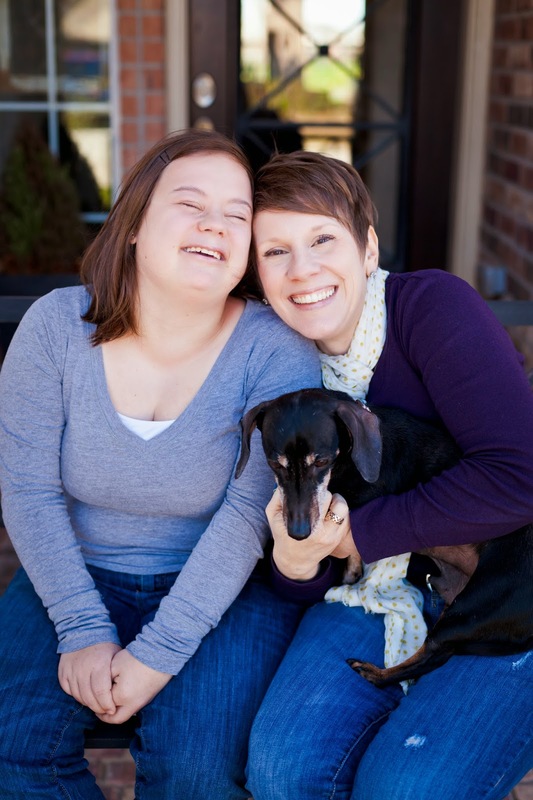 She is a painter, decorator, teacher and blogger and she also just so happens to have a daughter with Down syndrome. In one of our conversations she said something to me that I will remember and pass on to other mommas. We were talking about how we "grieved" what we thought life and our daughters were "suppose to be" when we found out they had Down syndrome. "It's funny, one of the things I was so sad about, was thinking Sara wouldn't go to Prom," Tricia told me and before I could chime in with a "Me too" she said, "Sara has been to 6 Proms - If I could give one bit of advice to other mommas out there who are just starting on this journey. Love more and worry less. I look back on the things I used to worry about that never came to be and realize that it was wasted time. Things always had a way of working themselves out, and Sara continued to surprise and amaze us along the way. Don't set the ceiling for what your child will accomplish. It will be so much more than you ever imagined." 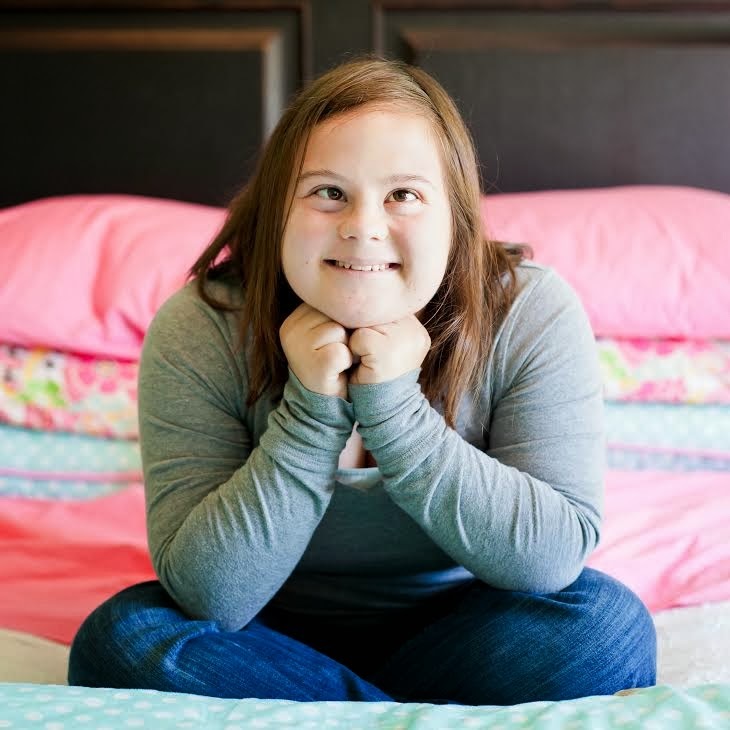 As for the Prom Queen herself, Sara is 21, enjoys swimming and bowling for Special Olympics, hanging out with her boyfriend, singing karaoke like a rock-star and spending time with her family. 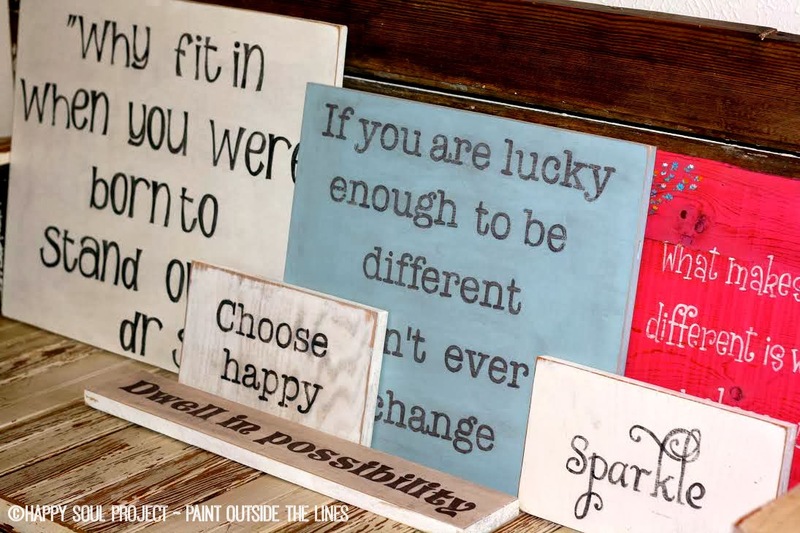 Sara is the inspiration behind "Painting Outside the Lines" and works with her mom creating our one of a kind home decor signs with uplifting, powerful & inspiring messages. What does Happy Soul Project & Painting Outside the Lines mean to you? Being a part of Happy Soul Project and Painting Outside the Lines means changing perceptions of others regarding adults with Down Syndrome and their ability to positively and productively contribute to society. 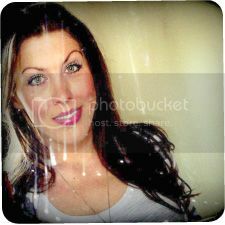 For Sara it is an opportunity for her to do something she loves and be a part of something bigger than herself. Sara has a positive outlook on life and is a master at reveling in the little things. She doesn't take experiences or the people around her for granted, and I am confident that spirit will shine through the signs we make. What did you think when I first approached you with the idea? I was so excited! Sara is aging out of the public school system this year and I was anxious about coming up with something purposeful for her to do with her time. The school kept suggesting things that I knew she wouldn't love and made me feel uneasy about her safety.Sara had been looking at my Instagram each morning as she waited for the bus, and pictures of Pip would pop up. She would tell me, "I like that little girl, she's sweet like me." We were already painting furniture together, so transitioning to just signs is really just kismet. What's your favourite sign so far? Our favourite sign so far is the one we did for you! Just the words,"be awesome today", are words that we can all live by. It's not about being perfect, how you measure up to someone else, or having the BEST day, but simply going out there and being the awesome person you are. What message or feeling do you want people to have when they get one of your signs? I would hope that anyone who purchases one of our signs knows that there is not only meaning in the words, but a special person had a hand in making it. Sara takes pride in her painting, waxing and distressing of the signs- it is purposeful work that she can do independently. The messages are all ones of positive thinking, joy and love. If we all took those sayings to heart and carried them with us throughout our day think of what an amazing world we would live in! What do you hope to come from this? I hope that someday soon there is an online workshop community of people with special needs that can produce and sell their art work online. That others will support their endeavors and celebrate their differences. That eventually we will reshape people's perceptions of "disabled" into the realization that we are all differently abled, and that each person brings a unique talent to the table. And a big thank you to everyone who helps support our "Painting Outside the Lines" Collection. Love this all of it. Not disabled but differently abled. What a fantastic way to phrase it! Don't forget about your cute little boy too, you don't want him to feel left out.